Human history is often framed as a series of episodes, representing sudden bursts of knowledge. The Agricultural Revolution, the Renaissance, and the Industrial Revolution are just a few examples of historical periods where it is generally thought that innovation moved more rapidly than at other points in history, leading to huge and sudden shake-ups in science, literature, technology, and philosophy. Among the most notable of these is the Scientific Revolution, which emerged just as Europe was awakening from an intellectual lull referred to by historians as the dark ages. Much of what was considered known about the natural world during the early middle ages in Europe dated back to the teachings of the ancient Greeks and Romans. And for centuries after the downfall of the Roman empire, people still generally didn’t question many of these long-held concepts or ideas, despite the many inherent flaws. The reason for this was because such “truths” about the universe were widely accepted by the Catholic church, which so happened to be the main entity responsible for the widespread indoctrination of western society at the time. Also, challenging church doctrine was tantamount to heresy back then and thus doing so ran the risk of being trialed and punished for pushing counter ideas. An example of a popular but unproven doctrine was the Aristotelian laws of physics. Aristotle taught that the rate at which an object fell was determined by its weight since heavier objects fell faster than lighter ones. He also believed that everything beneath the moon was comprised of four elements: earth, air, water, and fire. As for astronomy, Greek astronomer Claudius Ptolemy’s earth-centric celestial system, in which heavenly bodies such as the sun, moon, planets and various stars all revolved around the earth in perfect circles, served as the adopted model of planetary systems. And for a time, Ptolemy’s model was able to effectively preserve the principle of an earth-centered universe as it was fairly accurate in predicting the motion of the planets. When it came to the inner workings of the human body, the science was just as error-ridden. The ancient Greeks and Romans used a system of medicine called humorism, which held that illnesses were the result of an imbalance of four basic substances or “humors.” The theory was related to the theory of the four elements. So blood, for instance, would correspond with air and phlegm corresponded with water. Fortunately, the church would, over time, begin to lose its hegemonic grip on the masses. First, there was the Renaissance, which, along with spearheading a renewed interest in the arts and literature, led to a shift toward more independent thinking. The invention of the printing press also played an important role as it greatly expanded literacy as well as enabled readers to reexamine old ideas and belief systems. And it was around this time, in 1517 to be exact, that Martin Luther, a monk who was outspoken in his criticisms against the Catholic Church's reforms, authored his famous "95 theses" that listed all of his grievances. Luther promoted his 95 theses by printing them out on a pamphlet and distributing them among the crowds. He also encouraged churchgoers to read the bible for themselves and opened the way for other reform-minded theologians such as John Calvin. The Renaissance, along with Luther’s efforts, which led to a movement known as the Protestant Reformation, would both serve to undermine the church’s authority on all matters that were essentially mostly pseudoscience. And in the process, this burgeoning spirit of criticism and reform made it so that the burden of proof became more vital to understanding the natural world, thus setting the stage for the scientific revolution. In a way, you can say that the scientific revolution started out as the Copernican Revolution. The man who started it all, Nicolaus Copernicus, was a Renaissance mathematician and astronomer who was born and raised in the Polish city of Toruń. He attended the University of Cracow, later continuing his studies in Bologna, Italy. This is where he met astronomer Domenico Maria Novara and the two soon began exchanging scientific ideas that often challenged the long-accepted theories of Claudius Ptolemy. Upon returning to Poland, Copernicus took up a position as a canon. Around 1508, he quietly started developing a heliocentric alternative to Ptolemy’s planetary system. To correct some of the inconsistencies that made it insufficient to predict planetary positions, the system he eventually came up with placed the Sun at the center instead of the Earth. And in Copernicus’ heliocentric solar system, the speed in which Earth and other planets circled the Sun was determined by their distance from it. Interestingly enough, Copernicus wasn’t the first to suggest a heliocentric approach to understanding the heavens. The ancient Greek astronomer Aristarchus of Samos, who lived in the third century B.C., had proposed a somewhat similar concept much earlier that never quite caught on. The big difference was that Copernicus’ model proved to be more accurate at predicting the movements of the planets. Copernicus detailed his controversial theories in a 40-page manuscript titled Commentariolus in 1514 and in De revolutionibus orbium coelestium ("On the Revolutions of the Heavenly Spheres"), which was published right before his death in 1543. Not surprisingly, Copernicus’ hypothesis enraged the Catholic church, which eventually banned De revolutionibus in 1616. Despite the Church’s indignation, Copernicus’ heliocentric model generated a lot of intrigue among scientists. One of these people who developed a fervent interest was a young German mathematician named Johannes Kepler. In 1596, Kepler published Mysterium cosmographicum (The Cosmographic Mystery), which served as the first public defense of Copernicus’ theories. The problem, however, was that Copernicus’ model still had its flaws and was not completely accurate in predicting planetary motion. In 1609, Kepler, whose main work was coming up with a way to account for the way Mars’ would periodically move backward, published Astronomia ​nova (New Astronomy). In the book, he theorized that planetary bodies didn’t orbit the Sun in perfect circles as Ptolemy and Copernicus had both assumed, but rather along an elliptical path. Besides his contributions to astronomy, Kepler made other notable discoveries. He figured out that it was refraction that allows for the eyes’ visual perception and used that knowledge to develop eyeglasses for both nearsightedness and farsightedness. He was also able to describe how a telescope worked. And what’s less known was that Kepler was able to calculate the birth year of Jesus Christ. Another contemporary of Kepler’s who also bought into the notion of a heliocentric solar system and was the Italian scientist Galileo Galilei. But unlike Kepler, Galileo didn’t believe that planets moved in an elliptical orbit and stuck with the perspective that planetary motions were circular in some way. Still, Galileo’s work produced evidence that helped bolster the Copernican view and in the process further undermine the church’s position. 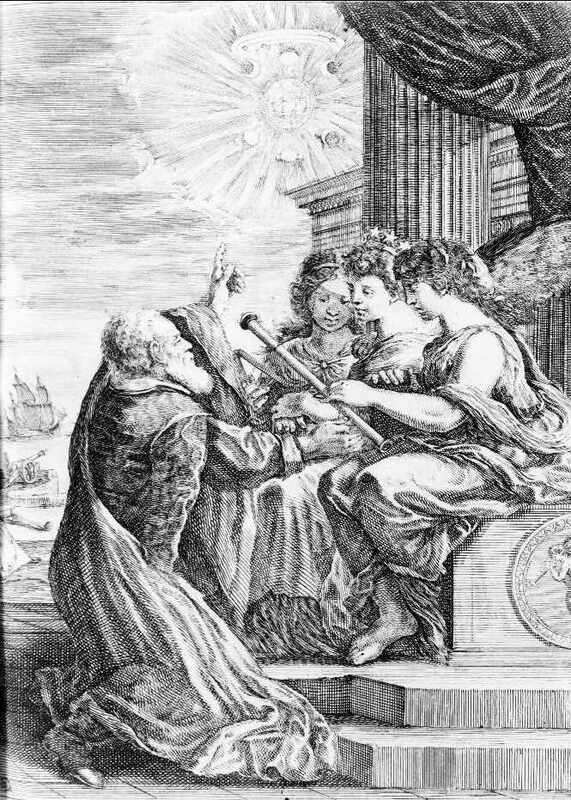 In 1610, using a telescope he built himself, Galileo began fixing its lens on the planets and made a series of important discoveries. He found that the moon was not flat and smooth, but had mountains, craters and valleys. He spotted spots on the sun and saw that Jupiter had moons that orbited it, rather than the Earth. Tracking Venus, he found that it had phases like the Moon, which proved that the planet rotated around the sun. Much of his observations contradicted the established Ptolemic notion that all planetary bodies revolved around the Earth and instead supported the heliocentric model. He published some of these earlier observations in the same year under the title Sidereus Nuncius (Starry Messenger). The book, along with subsequent findings led many astronomers to convert to Copernicus’ school of thought and put Galileo in very hot water with the church. Yet despite this, in the years that followed, Galileo continued his “heretical” ways, which would further deepen his conflict with both the Catholic and Lutheran church. In 1612, he refuted the Aristotelian explanation of why objects floated on water by explaining that it was due to the object’s weight relative to the water and not because an object’s flat shape. In 1624, Galileo got permission to write and publish a description of both the Ptolemic and Copernican systems under the condition that he does not do so in a manner that favors the heliocentric model. The resulting book, “Dialogue Concerning the Two Chief World Systems” was published in 1632 and was interpreted to have violated the agreement. The church quickly launched the inquisition and put Galileo on trial for heresy. Though he was spared harsh punishment after admitting to have supported Copernican theory, he was put under house arrest for the remainder of his life. Still, Galileo never stopped his research, publishing several theories until his death in 1642. While both Kepler and Galileo’s work helped to make a case for the Copernican heliocentric system, there was still a hole in the theory. Neither can adequately explain what force kept the planets in motion around the sun and why they moved this particular way. It wasn’t until several decades later that the heliocentric model was proven by the English mathematician Isaac Newton. Isaac Newton, whose discoveries in many ways marked the end of the Scientific Revolution, can very well be considered among one of the most important figures of that era. What he achieved during his time has since become the foundation for modern physics and many of his theories detailed in Philosophiae Naturalis Principia Mathematica (Mathematical Principles of Natural Philosophy) has been called the most influential work on physics. In Principa, published in 1687, Newton described three laws of motion that can be used to help explain the mechanics behind elliptical planetary orbits. The first law postulates that an object that is stationary will remain so unless an external force is applied to it. The second law states that force is equal to mass times acceleration and a change in motion is proportional to the force applied. The third law simply stipulates that for every action there is an equal and opposite reaction. Although it was Newton’s three laws of motion, along with law of universal gravitation, that ultimately made him a star among the scientific community, he also made several other important contributions to the field of optics, such as building he first practical reflecting telescope and developing a theory of color.